If you haven't yet met 270 KTA in person, may I recommend the next best thing to tide you over until gearbox repairs are finished? Robin from RT Realfilms handed over a DVD at the weekend. He's captured every aspect of our recent adventures in Looe when, you'll recall, we ran alongside the Great Western Steam Railmotor on the picturesque Cornish branch line. Together with Colin Billington's Bristol H, we're shown 'racing' the train between Liskeard in wonderful scenes not unlike The Titfield Thunderbolt in spirit. Of course, it wasn't a race - the route via St Keyne and Duloe is a hilly one for both road and rail - but it's amazing how sprightly things look in the edit. Copies of "GWR Steam Railmotor & Western National Buses" (30 mins) are available from R T Realfilms, 21 High Street, Wick, Bristol, BS30 5QJ, for £12. And for Railmotor fans, it will be in action again this weekend on the South Devon Railway, with bus fun provided by TV&GWOT in the shape of Bristol H 137 and (in 270 KTA's absence) Bristol LWL 1613, the latter in the charge of Driver Sheppard. This blog is an ongoing chronicle of the adventures I share with my preserved 1962 Bristol SUL4A coach. Here you'll find tales aplenty of the joy and strife associated with keeping alive a 55 year old vehicle. Our adventures have been many and varied over the past seven years. The blog’s archive contains rich and colourful stories of success and failure that have typified life with 270 KTA so far; stories of man and machine in perfect harmony, briefly but sometimes brutally interrupted by the odd discordant note. 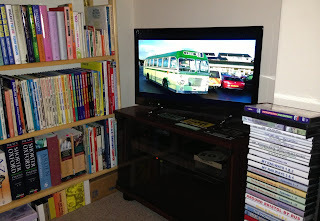 This blog now has a 'brother' in BDV252C.co.uk, which follows the long-term restoration of my 1965 Bristol SUL bus. To balance the tales of woe and elation in each story, I recommend you follow the two blogs in equal measure! 270 KTA (420) is a 1962 Bristol SUL4A coach, one of 36 such coaches built for Western National and Southern National for use in the West of England. They were predominantly for local tours but also provided relief on express services to London and the North during busy periods. 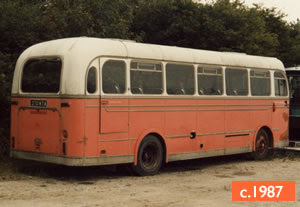 Bristol's SU-type was a narrow, lightweight chassis designed specifically for use in rural areas. As well as the South West, SU coaches found their way to Wales, with bus-bodied counterparts in Yorkshire, the Isle of Wight and parts of the Home Counties. 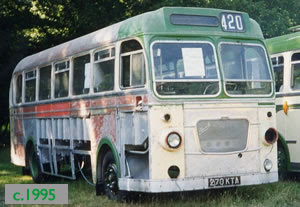 420 has a 33-seat body built by Eastern Coachworks of Lowestoft and a 4-cylinder Albion EN250H diesel engine, mounted horizontally underfloor and coupled to a David Brown 5-speed gearbox. 420 worked from Western National's Kingsbridge depot when new, where it was to be pride of the fleet for six years. With the decline in local coach tours it moved to Taunton where, along with most other SU coaches, alterations were made to enable use on local bus routes. 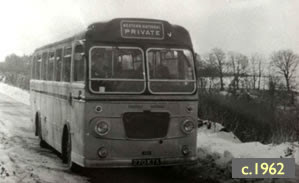 420 was renumbered 1220 in June 1971 and, following a spell at Bridgwater depot, was transferred to the Devon General fleet. Accordingly, it received poppy red and white livery - the only SUL coach to be so treated. It was also the only one of its batch to be fully downgraded to bus configuration, with the removal of headrests and the addition of extra seats. Withdrawn from Weymouth depot (still red), '1220' later worked as a school bus in Sussex, before returning to the West to join the fleet of Willis, Bodmin. It was donated to the Western National Preservation Group in 1995, and remained with them for several years, although its poor mechanical state meant it was little used. Purchased by me in December 2009, it was returned to the road in 2011 after major mechanical attention. A rolling programme of restoration has continued while allowing 420 to be used at events and enjoyed by others. By fluke or fate, it now lives just a few miles away from its original home in Kingsbridge and is part of a family fleet of five preserved Bristol vehicles. David Sheppard lives in the South West of England. 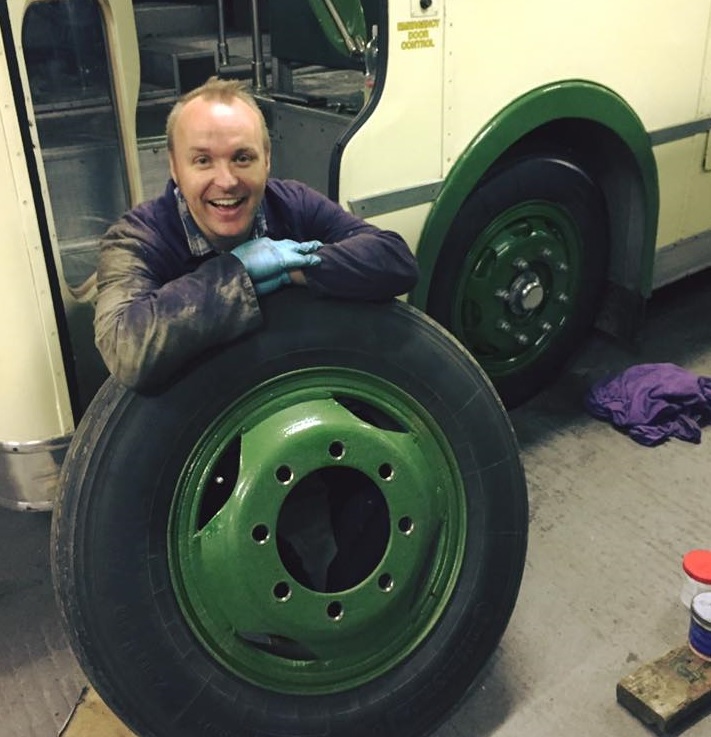 He has been involved in bus and coach preservation for more than 25 years, having helped his father to restore their first bus at the age of seven. David is a trustee and director of the Thames Valley & Great Western Omnibus Trust and a director of NARTM, the National Association of Road Transport Museums, which represents the heritage transport movement to Government departments and agencies, regulators and funding bodies. A broadcaster by trade, he hosts his own regional show on BBC radio stations across the south‐western quarter of the UK and Channel Islands. Copyright: David Sheppard, 2010. Simple theme. Powered by Blogger.